Siri Eyes Free technology and LED fog lights are now standard equipment for the Lexus ES, and the ES 350 model is offered with the same Bamboo interior wood trim that was exclusive to the ES 300h model last year. The standard NuLuxe leatherette seats are now available with heating and ventilation for 2014. The Lexus ES is offered as the ES 350 equipped with a V-6 engine and as the ES 300h with a gasoline-electric hybrid powertrain. Each is well equipped in base format, and can be upgraded with a choice between Premium, Luxury, and Ultra Luxury option packages. Numerous dealer-installed accessories are also available. Highlights from the standard equipment list include NuLuxe leatherette upholstery, 10-way power front seats, and an 8-speaker premium sound system with satellite radio, Bluetooth connectivity, and a USB port. The Lexus ES also includes Smart Access passive entry with push-button starting, a power sunroof, a dual-zone automatic climate control system with a smog sensor, and more. A 3.5-liter V-6 engine is standard for the 2014 Lexus ES 350, delivering 268 horsepower to the car’s front wheels through a 6-speed automatic transmission. The ES 300h hybrid model pairs a 2.5-liter 4-cylinder engine with an electric assist motor powered by a nickel-metal hydride battery pack. The combined power rating is 200 horsepower. 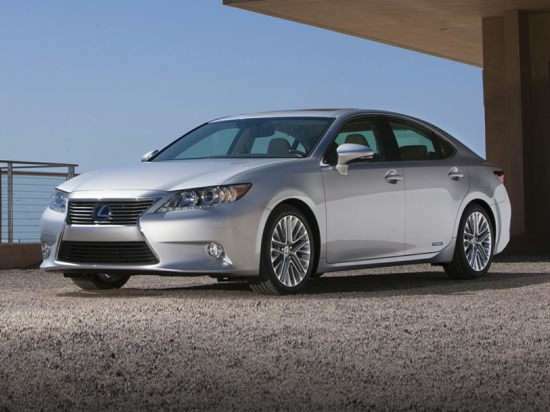 In combined driving, the Lexus ES 350 is rated to get 24 mpg. The more expensive Lexus ES 300h is rated to get 40 mpg in combined driving, helping to justify its $2,880 price premium over the faster but less efficient ES 350. Safety Connect is standard for the 2014 Lexus ES, including a one-year subscription to Automatic Collision Notification, an Emergency Assistance SOS button, Stolen Vehicle Tracking, and more. Additional safety-related technologies include front and rear parking assist sensors, a standard or wide-view reversing camera, rain-sensing wipers, and intelligent high-beam headlights. A Blind Spot Monitor with Rear Cross-traffic Alert is optional, as well as a Lane Departure Alert system with Lane Keep Assist technology, and a Dynamic Radar Cruise Control with Pre-Collision System. Lexus ES buyers can also upgrade their luxury cars with a Mark Levinson surround-sound audio system, HD Radio, iTunes tagging capability, and Lexus Enform smartphone pairing technology, including App Suite access to Internet radio, Bing search, Facebook places, and more. A navigation system is also optional, and includes real-time traffic and weather reports as well as SMS text-messaging with voice reply.